When I was little, the movie Watership Down gave me nightmares. At the time I was too young to have read the book, but my super-cool babysitter happened to be watching it on television (maybe so she could skip the book.) It was the first violent cartoon I had seen and it left scars. My imagination has always been vivid and the artistic side of me has been as sharp as a razor. I can only wonder about what could be had my math skills been a fertile as my ability to hone in on the existential. As it is, I can delve into the world of literature and film and find subtle innuendo's and beauty in the absurd yet I still need my fingers to add 8+7. My scales are so out of balance. It's no wonder I still have dreams about an ominous field of blood oozing out of a red sunset towards defenseless creatures. And to this day, I drive very carefully through an area where I know there are rabbits and deer. I couldn't sleep for days after watching the movie and I didn't want to tell my parents what was wrong. I loved my babysitter, she let me stay up late playing Kangaroo on the Atari. Instead I transferred the blame to my older sister, saying that we had watched Poltergeist and that I was afraid my closet wanted to eat me...though it was not a complete lie, I had the same sheets as Carol Ann. Poltergeist is one of the many, many reasons why I hate clowns and where I learned to count how far away a storm was based on the seconds between the lightening and the thunder. In order to calm me down, my mom made some hot lemon tea and served it with a few gingersnaps (see, I was going somewhere with all this.) From that point on, I have loved gingersnaps. They will always be a source of comfort and warmth. This recipe offers the best of two worlds. 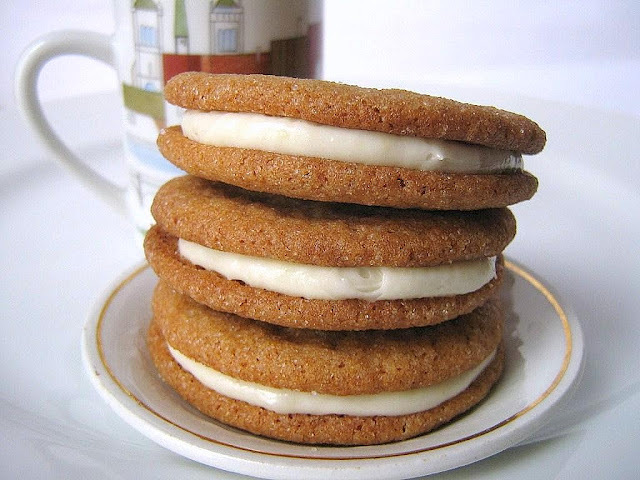 The spicy undertone of the classic gingersnap, and the soft creamy center of a sandwich cookie. The original recipe called for an orange cream filling but I love my lemons and it's been too long since our last meeting. I think the light spice from the ginger flirts nicely with the tart lemon. They make a lovely couple, I'm jealous. The cookies are slightly crunchy, which is good. 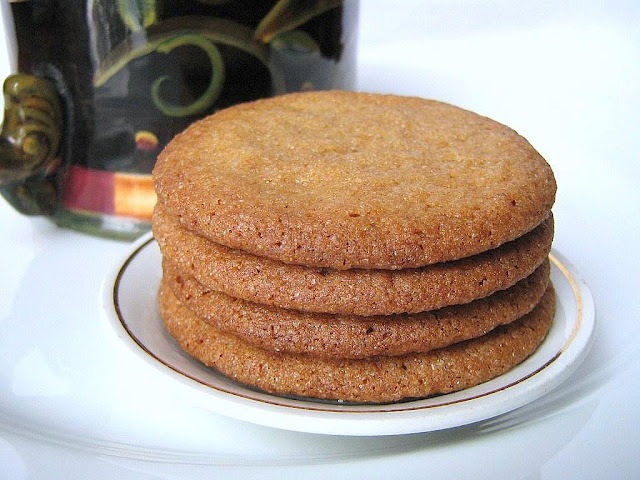 A chewy gingersnap would be like a flat champagne. The lemon ginger cream cheese filling lives up to everything in it's title. I was heavy handed with the lemon because I didn't want the flavour to be boxed in by the gingersnaps. These are exquisite cookies. I'll be the first to admit that I'm a bit on the superstitious side, I'll knock on wood if I feel a hex is on the horizon. But these cookies really do have a way of warding off nightmares about the evils of mankind, hungry closets, and psychotic clowns. When I eat them, I feel as though everything really will be alright. I hope they have the same affect on everyone. (adapted from Oprah.com) You know you watch her too. 4 ounces (1/4 cup) of cream cheese, softened to room temp. Cookies: In a medium bowl, whisk together the flour, baking Soda, cinnamon, ginger, allspice, and salt. Set aside. In a large bowl, beat the butter for about 30 seconds. Add 1/2 cup of the granulated sugar, and all of the brown sugar. Beat on medium speed for about 2 minutes until fluffy. Add the molasses, honey, egg, and vanilla. *For easier removal, lightly spray and flour the measuring cups before adding the molasses and honey. * Beat on medium-high speed until well incorporated. Reduce the speed to low and gradually add the flour mixture. Mix until thoroughly combined. Cover well and refrigerate for at least 30 minutes. Preheat the oven to 350F. Line cookies sheets with parchment paper. Place the remaining 1/2 cup of granulated sugar into a wide, shallow bowl. Remove the dough from the refrigerator. Shape into balls about 1-inch in diameter. Roll the balls into the sugar until well-coated. I found it easier to make several at once and place them all into the sugar bowl. Once they are in, shake the bowl around and roll the balls a bit with your hands to coat. Place the cookies about 2-inches apart on the cookie sheets (they will get larger). Dip the bottom of a glass into the cookie dough, just to moisten it, then dip the bottom of the glass into the sugar bowl. This will stop the cookies from sticking to it. Gently press down on each of the balls until they are about 1/4 of an inch thick. Bake for 10-13 minutes or until they are just firm. Remove them from the oven and immediately transfer them to a cooling rack. Cool completely before filling. Filling: In a medium bowl, beat the cream cheese until soft and creamy. Add the vanilla extract, lemon zest, lemon juice, and ground ginger. Beat to incorporate. Slowly add the powdered sugar. Don't add it all at once or it will end up on the ceiling. Beat until you have a creamy, yet spreadable consistency. If it's too thin add a little bit more confectioners sugar. Place a rounded teaspoon on half the cookies. Cover with the remaining cookies and gently press down to form a sandwich. Oh those look wicked good. I think lemon would go better with them than orange too. And I've never seen Watership Down the movie, but it was by far one of my favorite books as a kid. I was seriously shocked when I learned that it's an allegory...I always just thought of it as a rabbit adventure story. And if you're into ginger, check out these cookies. They're chewy and delicious! I think that it may have convinced several people that cartoons were not always sunshine and happiness. Mollie, I did finally have to read the book in highschool but the movie damaged my psyche too much and tainted any appreciation for the actual story. These look so good!! 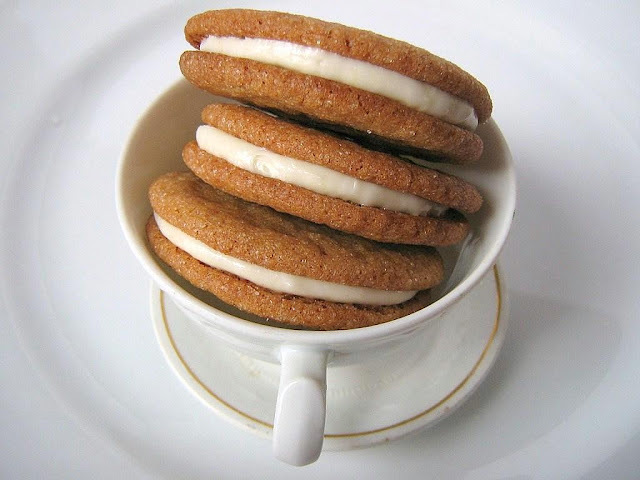 I don't think people appreciate ginger snaps as much as they used to, so I'm glad that you used them. The cream filling looks so tasty too. Thanks for sharing! I love gingersnap/molasses cookies! Love the idea of putting two together with some icing! These look incredible! 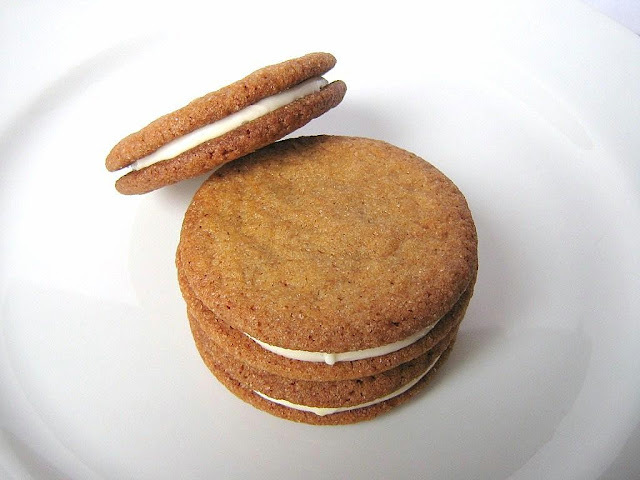 I've never seen gingersnaps with filling...yum! That's just the prettiest picture! I made something similar, but used butter pecan ice cream for a filling. And of course, froze them. The kids loved them! 1) I watched poltergeist at a friend's house in grade school and I don't think I ever recovered. Shudder. 2) WANT. THOSE. COOKIES. NOW. Ginger and lemon are two of my favorite flavors and those are totally gorgeous. Hi Rachel, I'm kind of relieved that t.v. stations no longer sign off late at night and go into creepy static mode. Although the Stepford wife-like infomercial audiences can be disturbing on a whole different level. Lemon is the perfect choice for this cookie! Oh, let me grab a handful of these and a nice cuppa and I'm one very happy girl. Thank you sooo much for sharing! Just made these this afternoon! They are totally delish! Mine did not end up very crispy, and that is fine, but they are terrific! I hope you don't mind me linking to it! I'm actually salivating as I look at these... These and EVERYTHING on your blog! So glad I found you! I'll be back! I love love love Watership Down. I have a specific shelf on my bookshelf designated only for my favorite books and it's the adventure story that balances out people like Jane Austen and Harper Lee. Though I can see how a cartoon made out of the book may not work out so well. It's really much more of a book for grown ups than you would think. That said, these cookies look delicious. I love the combination of ginger and lemon. I have to make cookies for a party and these are definitely going on the menu! I made these cookies a week ago for a party and everyone absolutely loved them. Ten girls were able to eat almost all of them. I forgot to press down on the dough before baking so the cookies came out in small, rounded half-spheres, and when I sandwiched them together they made little ginger-lemon footballs that were soft on the inside, crisp at the edges, and filled with that delicious lemony cream. It literally took all my self control not to simply eat the cream with a spoon from the bowl. These are happening again. After prom, so I will actually fit into a dress. But seriously, these are the best cookies I've had in a very long time. Thanks for letting me know how these cookies turned out.